Tiger Woods' impressive breakthrough at the Masters sets the stage for intense competition at the 2019 PGA Championship, which tees off on Thursday, May 16 at the Bethpage Black Course in Farmingdale, New York. 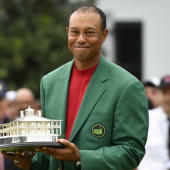 Woods' win at Augusta was his first major championship since 2008, but he almost won the PGA Championship last year by shooting three rounds of 66 or lower on his way to a second-place finish. The latest 2019 PGA Championship odds list Woods as the favorite at 17-2, with Dustin Johnson, who tied for second at Augusta, getting 19-2 along with Rory McIlroy. Justin Thomas (13-1) and defending champion Brooks Koepka (18-1) round out the top five 2019 PGA Championship favorites. There's still about a month until golf's second major tees off, but the betting action is already heavy, with plenty of hype surrounding the next major on the PGA schedule. Before locking in any 2019 PGA Championship picks, be sure to see the PGA predictions from SportsLine's proven projection model. SportsLine's prediction model, built by DFS pro Mike McClure, has nailed four majors entering the weekend and called Tiger Woods' deep run in the last PGA Championship despite being a 25-1 long shot. The model has been spot-on early in the 2018-19 season. It was high on champion Rory McIlroy at the 2019 Players Championship, projecting him as one of the top two contenders from the start. It also correctly predicted Brooks Koepka's (9-1) victory at the CJ Cup. Additionally, it correctly called Bryson DeChambeau's (9-1) seven-shot victory at the Omega Dubai Desert Classic. Anyone who has followed the model is way up. Now with the 2019 PGA Championship field taking shape, SportsLine simulated the event 10,000 times, and the results were surprising. One huge shocker the model is calling for: Woods, a four-time champion, reigning Masters winner, and the top Vegas favorite, doesn't even crack the top five. Woods is coming off one of the most historic victories in recent memory at the 2019 Masters. The 15-time major champion shot a 2-under par 70 to win his first green jacket since 2005 and his first major since the 2008 U.S. Open. His victory at Augusta National was the first time in his career that he came from behind to win a major. However, Woods struggled in 2012 at The Barclays, his last start at Bethpage. He finished the tournament at 1-over par after shooting a final-round 76, a 38th-place finish. SportsLine's model isn't calling for back-to-back major victories and sees far better values in this loaded field than the 17-2 premium he's commanding, lower than the 14-1 he was fetching at the Masters. Another surprise: Rickie Fowler, a 21-1 long shot, makes a strong run at the title. He has a much better chance to win it all than his odds imply, so he's a target for anyone looking for a huge payday. While Woods broke an extended drought at the Masters, Fowler is still looking for his first major win. He came close at Augusta, firing a 10-under par for the tournament, including a 68 in the third round and a 69 on Sunday to surge into the top 10. He's finished in the top three in all four majors during his career, including a third-place finish at the PGA Championship in 2014. And the model says he'll be in contention again at Bethpage as he brings the ninth-best scoring average (69.87) on the PGA Tour to Long Island. Fowler has an Official World Golf Ranking of No. 10 and is No. 8 in the FedEx Cup standings. He has all the skills needed to climb the 2019 PGA Championship leaderboard as he looks for a career-defining win. Also, the model says four other golfers with 2019 PGA Championship odds of 18-1 or longer make a strong run at the title. Anyone who backs these underdogs could hit it big. So who will win the 2019 PGA Championship, and which long shots stun the golfing world? Check out the 2019 PGA Championship odds below and visit SportsLine now to see the 2019 PGA Championship projected leaderboard from the model that nailed the winners of four golf majors.